When you are getting a home inspection, you want the best. We have 400+ reviews from our clients on Google, Facebook, Angie's List, and Yelp. No other home inspection company compares. When you get a home inspection, you want the best. Our clients have left us hundreds of reviews saying, "they were very thorough, answered all of our questions, pointed out things I never would have noticed, their report helped me negotiate repairs on the house, they let us know what needed to be fixed right away and what could be fixed later, they sent an easy-to-read inspection report with pictures, the inspector was patient, kind, and explained everything in a way I could understand". 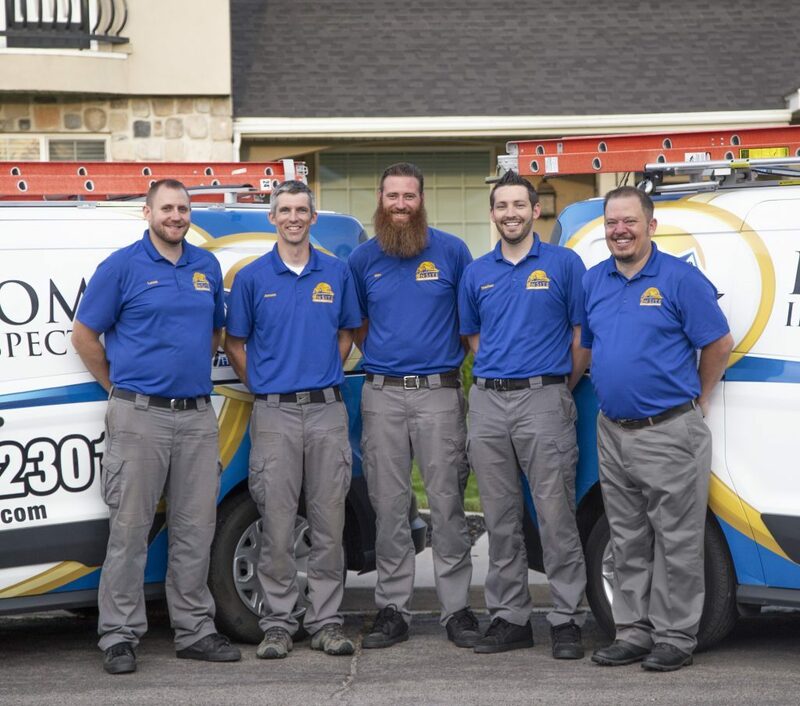 We offer more than any other home inspection company to ensure you are taken care of from the moment you schedule your inspection until after your home inspection is complete. Give us a call and experience the OnSite difference. We complete the report onsite with a mobile device and take pictures as we go. This means we can deliver the report the same day the inspection takes place, often within only a few hours. We have perfected the process of inspecting a house. We inspect every component with detail to find issues so that you know what you are getting into. In addition to full home inspections, we offer termite inspections, infrared camera scans, radon gas measurement, mold testing, meth testing, asbestos testing, and lead-based paint testing. Our inspectors take pictures of major items, as well as helpful tips such as the location of the main water shutoff. We also include videos in the report, if needed. This helps identify the issues to hand over to the seller or a contractor to repair. Our reports are 25-60 pages of detailed issues that are documented in a simple way. A summary shows you the major issues in red text. Items to keep an eye on are in orange. Minor or maintenance items are in blue. We have multiple home inspectors who are all expertly trained and certified through the International Association of Certified Home Inspectors. They also complete yearly continuing education courses and quality control check-ups. We are here to help and make sure that you have a wonderful experience with our company. We have a team of dedicated people ready to serve you! Give us a call today! Every house should get an infrared camera scan. Here are a few of the things we have found: missing insulation in the exterior walls, missing insulation in areas of the attic, missing insulation in unaccessible areas of the attic (where no access was cut in), overheating electrical receptacles and switches, drain clogs, water line leaks, drafts at exterior doors and windows, covered heating/cooling vents that were never cut out, air leakage in ductwork, wet drywall at the walls and ceilings, wet floors, wet baseboards, leaking toilets, wet cabinets, and more. If there are any indications of current or past leaking in the house you are thinking of buying then an infrared camera scan will identify moisture that was not cleaned up or that remains in these areas. We hear the phrase "it's brand new" and "the builder has a one-year warranty" a LOT. Those are both true statements. BUT, a lot goes into building a house. Different contractors have to communicate to finish components in the house that overlap. the plumber installed the water heater exhaust and ran it out the roof by cutting a hole in the shingles, but forgot to call the roofer to come back and install the flashing properly to prevent leaks. the HVAC contractor went to install the ductwork but the framers installed structural components that needed to be cut to route the ductwork to where it needed to go. We have found leaks from loose plumbing connections, improperly installed siding, gaps in basement windows where caulk was insufficient, improperly sloped grading, low water pressure, mold on the lumber used inside the house, improper materials used, missing shingles, broken windows, moldy crawlspaces, wet insulation, and certain items that were forgotten. Bottom line: get a home inspection. We can identify issues for you to hand over to the builder so that they can get the contractors out to repair them BEFORE you move in. Yes, the builder has a warranty, but when will issues manifest themselves? If you discover them more than a year after your house is built then it's your responsibility. Contrary to what many people THINK, there ARE termites in Utah. They are just the quiet type. There are several different species of termite and Utah has what are called subterranean termites. This variety lives in the ground and builds mud tunnels up into the house to find wood, paper, and other organic materials they can eat. Termites in Utah are most prevalent in cities that used to be, or are currently, orchards such as Orem, Pleasant Grove, and American Fork. Termites are found mostly in older homes because they didn't pressure-treat the wood, apply termiticide, they built them with wood touching the soil, which makes easy access for termites, or a lot of time has passed so the termites have entered the house over that period. We've found termites in houses as new as 2007. They can sometimes be hard to spot. We inspect the foundation, interior walls, ceilings, trim, etc. as well as areas where there have been or are current leaks to spot these wood-destroying pests. Treatment for termites in Utah can cost $500-$4,000+ depending on the severity of the infestation and size of the house. This does not include any structural damage that they have caused. Sewer scopes are one of the inspections we perform that has the greatest return on investment. You spend a couple hundred dollars for a sewer scope with the potential of finding $3,000-10,000+ in damages and repairs that are needed. A lot of people don't know that YOU are responsible for the sewer line that goes from your house out to the street. And the repairs are usually very expensive. No age of home is immune to sewer problems. While it’s unlikely, even new homes can have problems with the main sewer line. Old homes should ALL have a sewer scope to find issues such as breaks, offsets, bellies, clogs, root intrusion, etc. It alerts the seller of any issues that need immediate attention such as gas leaks, plumbing leaks, missing shingles, high radon, etc. Repairs can be made before anyone sees the house. This makes your house present better at showings. Repairs can be made for less money because you have time to get bids and find the best person to make the repairs. You won't be at the mercy of the buyer when they come to negotiate since you will either have the repairs already done or will have gotten an idea on how much the repairs actually cost instead of relying on the buyer. You can make repairs and have the inspector update the report, which you can then provide to those coming to see the house. You save a lot of back and forth negotiation time and headache. The seller gets to choose their own home inspector instead of being at the mercy of a home inspector that the buyer hires. The seller can schedule the inspection at their convenience instead of at the buyer's convenience. Every house in Utah should be tested for radon. There are documented cases of individuals getting lung cancer due to high radon levels. There are two main reasons to test for radon: lung cancer and money. A typical mitigation system to lower high radon costs approximately $1,200-1,600+. If your test comes back high that gives you an opportunity to possibly negotiate for mitigation. The way that we test for radon (with a machine) is catered to real estate transactions. The turnaround time is 48-72 hours so that you can meet your due diligence deadlines. We use professional monitors that are AARST certified. We are also an unbiased independent third party. There are also options to test your own home with a Do-It-Yourself test kit, but these usually take 5-7 days to get the results since they must be mailed to a lab for analysis. We can take a swab sample of visible mold or air sampling if you suspect mold in a certain room or area. It takes a few days to get the results back from the lab. A mold test will identify what types of mold were present and the spore count at the exact moment in time that we took the test, and in that exact location. Those who should get a mold test are those with allergies or sensitivity to poor air quality. A mold test may also make sense when there is a musty smell or if there was significant water damage in the house. The report is professional and can be used in negotiating any needed repairs or to give to a remediation contractor. EVERY house in Utah should get a meth test done. This test has the highest return on investment if decontamination is needed. A test costs a couple hundred dollars and some decontamination can be upwards of $30,000 to clean the house completely. Utah used to be one of the highest states for meth use and labs in the country. Many labs are still found across the state. There are signs of meth use and "cooking" but these signs aren't always so obvious. We had a house come back at a 160 milligrams per 100 square centimeters. The "clean level" is below 1 mg. This house had 0 signs of meth use or cooking and was a nice townhouse built in 2011. Meth does not discriminate. Meth residue stays for years. A house could be completely painted, remodeled, have new flooring, etc. and STILL have meth residue in the ductwork and other areas. Meth residue cause health issues and the only way to discover if you have meth residue is to have the house test. We take swab samples of certain areas in the house and have those analyzed by a local lab. If the house comes back high for meth then a decontamination crew has to come in to remove all porous material or materials that can hold the meth residue such as carpet, curtains, boxes, furniture, clothes, and more. They then chemically clean all walls, ceilings, floors, ductwork, etc. When asbestos started being used in building materials it was considered a big advancement. Asbestos was strong, durable, and fire-resistant. Then, we discovered that asbestos was unsafe. When asbestos fibers are breathed in, they may get trapped in the lungs and remain there for a long time. Over time, these fibers can accumulate and cause scarring and inflammation, which can affect breathing and lead to serious health problems. We can inspect and check for what are called Asbestos-Containing Materials (ACMs) such as exterior siding, roofing, insulation, duct wrap, ceiling texture, ceiling tiles, floor tiles, etc. We can then take a sample of these areas, submit them to a lab for analysis, and learn whether they contain asbestos or not. IF they contain asbestos AND you plan on remodeling or doing something that will disturb the material then you will want to take care and remove the material properly. If you are NOT planning on disturbing the material then there are ways to ensure that it remains undisturbed. We offer lead-based paint surface testing to determine if the most recent layer of paint or areas of chipped paint are lead-positive. Lead-based paint was widely used up until 1978 because of its durability. The United States banned the manufacture of lead-based house paint in 1978 due to health concerns. Lead-based paint and lead contaminated dust are the most hazardous sources of lead for children. Houses built before 1978 are likely to contain some lead-based paint. However, it is the deterioration of this paint that causes a problem. It may also be a hazard when found on surfaces that children can chew or that get a lot of wear-and-tear, such as: windows and window sills, doors and door frames, and stairs, railings, and porches. Renovation, repair or painting activities can also create toxic lead dust when painted surfaces are disturbed or demolished.